German automotive manufacturer Audi is known for their reliable art of engineering. Although technology is of upmost importance to the internationally renowned brand, the company knows that customer care & service quality is every bit as important for long-term success. In order to defend and enhance their image on the automotive market, Audi entrusted Spectos with the measurement of their customer satisfaction. The company’s primary goal was to collect even more feedback from their busy customers to enable the continuous improvement their service quality, but without having to take up too much of their time. To assist the company in reaching their goal, Spectos created an innovative and dependable framework for a customer satisfaction measurement that worked with Audi’s customers’ busy schedules. As the large majority of Audi’s target audience is on the go and doesn’t have much time to spare, Spectos came up with the perfect Service Quality Monitoring Solution which combined three important factors for high response rates: flexibility, convenience, and brevity. The team at Feedbackstr was asked to create an innovative concept tailored to Audi’s wish of offering their customers great flexibility when it comes to how they submit their feedback. Audi respects that their customers are on the go and don’t always have time to submit feedback when called upon, which is why Feedbackstr is a perfect fit for them. Audi needed a measurement system which offeres customers flexibility, convenience, and brevity. The manufacturer also wished to reduce the amount of time consuming customer calls. 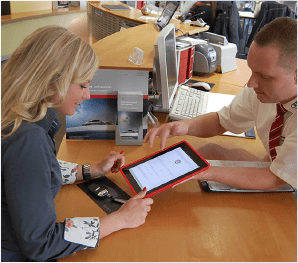 The omni-channel approach gives Audi drivers the freedom of choice when it comes to submitting their feedback, which automatically resulted in an increase in the amount of feedback the company received. And by displaying the customer feedback from the diverse channels used to collect feedback, Spectos makes evaluating the feedback as easy as submitting it is. This approach ensures Audi more and varied customer feedback by making it easy for Audi drivers to submit their feedback. And by gathering and displaying customer feedback from all of the channels listed above on one centralized platform, Spectos makes it as easy to evaluate feedback for Audi as it is for customers to submit their comments in the first place. In order to keep up with the fast-paced automotive industry, Audi required a fast-acting solution. Every one of Audi’s valued customers is different and has their own varying preferences and priorities, which is why the addition of multiple new communication methods was the key to receiving more actionable customer feedback to monitor Audi’s service quality. To be exact: Feedbackstr’s EFM Solution tripled the amount of feedback Audi received from its customers. The drastic increase in customer feedback, however, isn’t the only benefit Audi reaps from its collaboration with Feedbackstr. Thanks to the addition of their EFM Solution, Audi continues to receive customer feedback daily, enabling the company to review the development of its performance over time. The feedback they receive is also used to raise employee morale, leading to an increase in employee and customer satisfaction as well. Now that Audi has Feedbackstr on the passenger’s side to help navigate them towards the finish line, they’re guaranteed to come in first.